OWC Multi-Mount 2.5" to 3.5" and 3.5" to 5.25" bracket and cable set for 2006-2008 Mac Pro. . Looking to add more storage space to your Mac Pro? Want the speed of SSD without sacrificing a 3.5" drive bay? 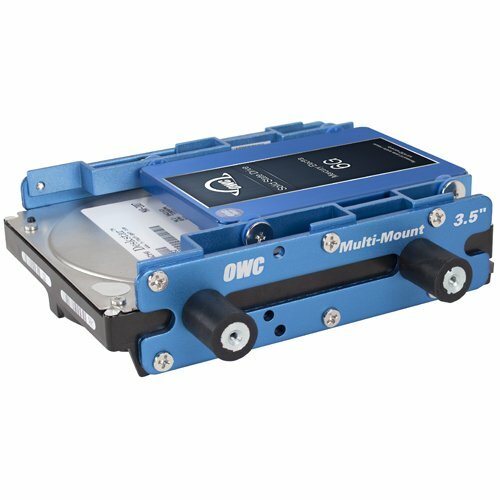 If you have an available 5.25" optical bay, OWC has you covered with the Multi-Mount. .
With this set of high-quality powder-coated aluminum brackets, you now have the freedom to install the drives you want, where you want them. Just place the drive on the bracket, attach it via the provided drive screws, and then attach the assembly onto the drive bay's brackets via the included bracket screws. . The 2.5" to 3.5" bracket is designed for use with the 3.5" to 5.25" bracket or in bays where standard, separate connection cables are used. Compatible with side mounted bays. Not compatible with front mounted bays like those for the hard drives in the Mac Pro. Installation Notes: 1. Pre-2013 Mac Pros are limited to a total of two SATA connections in the optical bay. If four SATA devices are installed in the bay, only two may be connected at any given time. This is a limit of the Mac Pro's architecture. Package Contents: One 2.5" to 3.5" Multi-Mount bracket set with four pre-attached rubber mounted drive screws for vibration control; One 3.5" to 5.25" Multi-Mount bracket set with four pre-attached rubber isolated mounting posts; Ten (10) Fine Thread Drive Screws; Twelve (12) Coarse Thread Drive Screws; One (1) 18" Serial ATA right angle connector to straight connector cable; One (1) 18" Serial ATA straight connector to straight connector cable; One (1) 4 Pin Male to 15 Pin Power "Y" 2 Position Cable; Hard Drives Available Separately; Assembly Manual for 2006-2008 Mac Pro Kits (Download only). Everything you need to install one SSD or 2.5" HDD and one 3.5" HDD to your 2006-2008 Mac Pro optical drive bay! Vibration dampeners reduce noise emittance from traditional platter-based drives. 100% powder-coated aluminum helps dissipate drive heat.